SALE OFF STANDARD RATE: $100 OFF ANY WEEK! $50 OFF ANY 2 NIGHT STAY! BRING YOUR FAMILY AND BOAT TO THIS LAKE FRONT CHARMING COTTAGE!! BOOK NOW YOUR CHOICE OF DATES AVAILABLE AT OUR LOW RATES!! PADDLE BOAT AND CANOE FOR YOUR ENJOYMENT!! 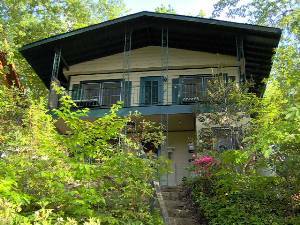 We invite you to unwind and relax in our charming cottage with glorious mountain and sunset views on Beautiful Lake Lure. Only four steps from the street and you enter into the top floor of our cottage which was renovated to include modern amenities while still retaining the rustic charm. We added old fashioned bead board ceilings upstairs and refinished the original wood floors. 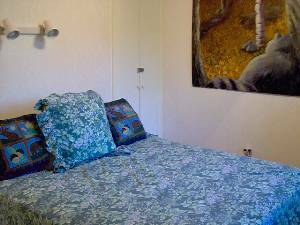 You will find one full bath (linens provided) with stack washer/dryer, vanity sink and tub/shower. 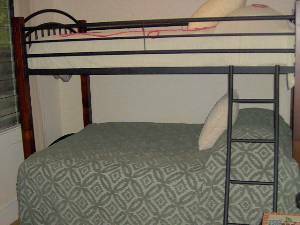 Down the hall you have two bedrooms, first bedroom with one queen size bed, and second bedroom as bunkbed with full mattress on bottom and twin mattress on top (linens provided). Step outside onto the upstairs porch to greet the morning with your tea or coffee and enjoy the glorious views of the lake and mountains. Downstairs is the living area with warm knotty pine paneling, one sofa, and one log futon (may be used to sleep on) and a chair to cozy up in front of the gas fireplace, and enjoy the entertainment center with a selection of books, games, movies, satellite tv w/DVD/VCR, and a cd player/radio. 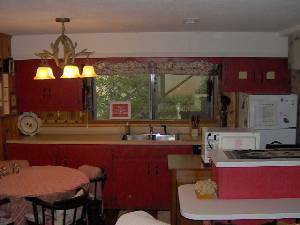 When you are ready to eat, you will find a fully equipped kitchen with microwave, frig, stove and a dishwasher to help clean up. You can move the cooking outdoors to the Weber gas or charcoal grill and keep an eye on the burgers from the downstairs back porch furnished with classic glider & bouncers. While you are enjoying the lake, you will find for your convenience the second bathroom located on the back porch, with shower, sink & commode. Porch bath is winterized and closed Nov-March. 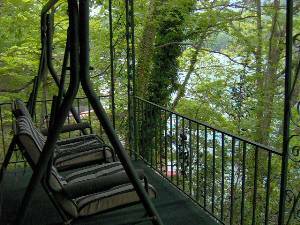 A few steps from the porch leads you down 12 stone steps to the deck/roof of the boathouse with dining & lounging furniture to while away the hours and wait for the sun to set after another perfect day on Lake Lure. Down another short flight of steps takes you to the dock where you will find a canoe (life jackets supplied) and a paddle boat for a slow cruise around the lake. Try your hand at fishing where past guests have caught trout and bass, (and some have caught a quiet time), or go for a swim to cool off in the clear waters of Lake Lure. Remember the water is at least 15 feet deep in front of our boathouse! 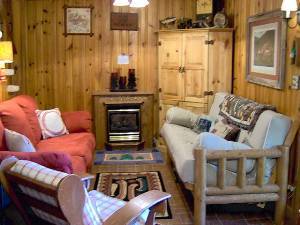 The Simple Life Cottage is located on the east side of the lake on a large quiet cove with a no wake zone (not far off the main channel), so that swimming, fishing, canoing and paddling is safe and fun. Selected as one of the ten most beautiful man-made lakes in the world by National Geographic, Lake Lure is nestled in the serene setting of the foothills of the Blue Ridge Mountains. You will discover the magic and bounty of nature in this wondrous canyon known as Hickory Nut Gorge. 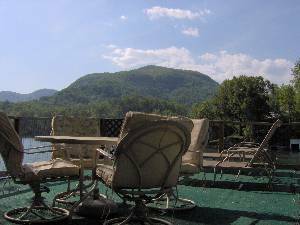 Lake Lure was built in 1925 and consists of approximately 1500 acres with 27 miles of shoreline. Major motion pictures filmed here include Firestarter, A Breed Apart, Dirty Dancing and Last of the Mohicans. The iso-thermal belt provides enjoyable climate and four season splendor year round. For the "Active Life": scenic attractions, Chimney Rock Park & hike to the waterfall seen in "Last of the Mohicans," horseback riding, 3 golf courses within 5 minutes, watersports, good food, quaint shops, Asheville, The Biltmore. For the "Simple Life": relax, lounge, nap, dream, lay around on the boathouse deck with a good book, and watch the day go slowly by. Best spot for gorgeous mountain and sunset views! 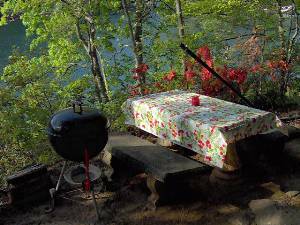 Catch a good night's sleep after hiking Chimney Rock or canoing or paddleboating or . . .
We're eating out tonight, outside that is. Lake side view of cottage from boathouse roof/deck with upper and lower porches. Mary Peffer was a very sweet and helpful person, and everything you need to know about the cabin AND the surrounding area is all available in a binder in the cabin. This was the best kept, best stocked cabin I have ever stayed in. WELL WORTH THE MONEY!! Deposit: Advance Deposit: 1/2 within 7 days of reservation. Final Deposit: Due one month prior to check-in, along with Refundable Security Deposit of $150 on separate check and signed Rental Agreement. Rates & Amenities are Subject to Change. Cancellations and Refunds: Cancellation: One month prior to check-in for refund, minus admin fee.